» See Despicable Me 2 This Weekend- For FREE! Home » Capital Region Deals » See Despicable Me 2 This Weekend- For FREE! 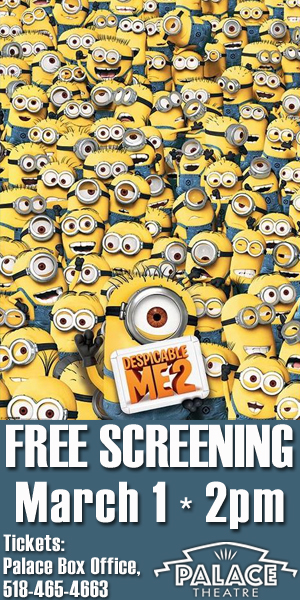 See Despicable Me 2 This Weekend- For FREE! This Saturday, the Palace Theatre in Albany will be offering a FREE showing of Despicable Me 2! Such a fun movie and a great free activity to do with the kids on this cold Saturday. To celebrate the Academy Awards coming up this Sunday and to unveil their new digital projector, the Palace will also be showing “Shakespeare In Love” at 5pm and “Argo” (a fantastic movie!) at 8pm – those movies are just $5. ← Win a Free Bottle of Dial Vitamin Boost Body Wash!